Recently I've been battling with some of the financial anxieties that come with an unpredictable freelance life. Jenna White offered to write me a guest post with some financial tips related to buying your first boat. There are a lot of things you should consider before making a large investment like buying a canal boat. You need to make sure you are financially stable and that you will be able to afford the costs that come with owning a boat, but there are many other things you should do as well. While you may think you can afford to make this investment now, it may not be the right time for you. Make sure you consider all of these tips before you go make a rash decision and invest in this expensive undertaking. 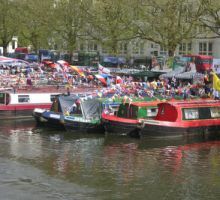 The first thing you should consider when you are thinking about buying a canal boat is your current financial situation. Have you incurred a lot of debt over the years and you are now struggling to pay it back? Do you have a problem with overspending or using your credit card to live beyond your means? These are signs that you need help getting control of your finances, and you may need to seek outside advice from a financial advisor or some other type of counsellor. In some cases, there will be more important things to save for than a boat. If you are in debt due to personal loans, student loans, or credit card spending, you should set those as your priority before you think about investing in a boat. Set a budget and use a specific amount to put toward paying off any debt. Once you have paid off your debt, you should use that money to start an emergency fund if you have not made one already. You should have at least six months’ worth of expenses in this fund, if not more, so that you can live with that money for a significant amount of time should an emergency arise (such as an accident or the loss of a job). Always live within your means and save as much as you can so that when you are able to buy your boat, you can still stay above water (with your boat and with your finances). When you have saved enough money to be comfortable, and when you have saved enough to at least make a significant dent in the total cost of the boat, it will be time to research your options. You probably already know a lot about the type of boat you want and any other special features you want it to have, but you should still educate yourself as much as possible. Never invest in something you don’t completely understand, and never buy something that you haven’t thoroughly checked out first. Even if you are buying the boat from your best friend, you should still take all of the necessary precautions to make sure that you are getting the best product for the money you will be spending. Is this truly the best time for you to buy a boat? As I said before, if you have credit card debt or owe the bank a lot of money due to loans, than this is probably not the best time for you to buy. You also never know if the price of the boat you want will go down in the future. This is where you will need to make a gamble. Buy the boat now and you may lose out on some money you could have saved, or wait a while and risk losing the boat to another buyer. Never fall in love with a boat you can’t afford, and be willing to walk away from an unfair offer. Whether you decide to make payments on a loan for your boat or save the money to buy it in full, you still need to consider the total cost of your investment. The total cost isn’t just going to be the purchase price, but it will also include the operating costs, maintenance costs, and other expenses that will come with the upkeep of your boat. Will you be able to afford all of these expenses over time? To answer this question, put all of these costs into your budget (leaning on the higher side to avoid miscalculation). This should help you make sure that you don’t take on an investment you can’t afford. Jenna White is an author who writes guest posts on the topics of business, marketing, credit cards, and personal finance. Additionally, she works for a website that focuses on educating readers about secured credit cards. Thanks very much. Really helpful and Now I can set my priorities up. Thanks once more. Waterways chaplains to help boaters!